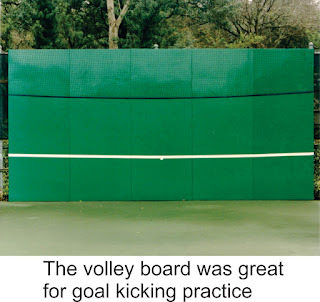 Both my parents were keen tennis players and to enhance their skills they built a volley board in our expansive backyard. It was quite an edifice, with a single tennis court sized concrete pad in front and the height of the board itself was about the same as the crossbar of a rugby goal post. Three or four of us would generally come forward and I would often win the ensuing contest and subsequently become the teams designated goal-kicker. I played on the wing for a time and then as a flanker or a number eight and back then it was a mystery to me as to why the All Black’s goal kicker was always the fullback. Surely there were locks or hookers or centres whose parents had volley boards in their backyards and had honed their skills to be at least as good if not better than the fullback? All this changed of course when Grant Fox came along. Overnight it was the first-fives who took all the kicks. Didn’t matter that some of them couldn’t kick their way out of a paper bag; think Wallaby first-five Bernard Foley in the recent Suncorp Stadium test against the All Blacks. If winger Reece Hodge hadn’t finally stepped up to the mark New Zealand would have won the contest quite comfortably. It’s an odds-on bet that Hodge’s parents were keen tennis players. ‘Tight heads’ were once a feature of the game, but now the side with the scrum feed can be certain of winning the ball, which begs the question: why have scrums at all? Scrums these days are always collapsing on themselves, causing injuries to the players and frustration to the viewers as the games get held up endlessly causing Grant Nisbett and his cohorts to eventually run out of idle chatter. Penalties for scrum infringements are given by referee guesswork which confuses the commentators and the laughable call sequence mantra, ‘crouch, bind, set’ sounds like an opening stanza for Morris dancing. Give the ball to the team offended against and let them have a free kick. Result: more movement and less injuries resulting in a free-running game that would make Rugby League look cumbersome by comparison. Then there is the business of the petulant player who throws the ball away robbing the opposition of the chance to have a quick throw-in. This infuriates me. It’s illegal of course, but the referees and the assistant referees are too busy admiring their images on the big screen to observe the infringement. And don’t get me started on the TMO’s. I don’t want to appear insensitive, but in most cases Stevie Wonder would do a better job. I’m amazed at the number of cameras that are available to focus on the player grounding the ball - or not - and after seeing all the angles in slow motion, with my 20/20 vision, it is abundantly clear to me the All Blacks almost always score and their opposition seldom do. And just to show that I am not biased towards our national team; why on earth do so many of them think they ought to have their hair cut like Kim Jong-un? If Donald Trump ever gets to see them with short backs and sides and their jelled-up mop tops he will probably issue orders to nuke them. And finally there’s their tasteless psychedelic footwear and multi-coloured mouth-guards. Some All Blacks already have yellow teeth so they don’t need a black and yellow tooth protector to make them look like as though they’re auditioning for a vampire movie. 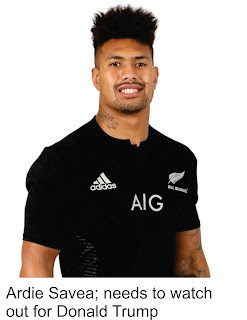 Polished black boots and pearly white mouth-guards should be a binding instruction from the public relations people at the NZRU. So my readers - both of you - will now recognise my analytical brilliance when it comes to rugby and I intend emailing the Rugby Union offering my services for the upcoming Northern tour. I will run the touchlines yelling advice through a hand-held megaphone. They will no doubt tell me I should have followed my parents and taken up tennis. 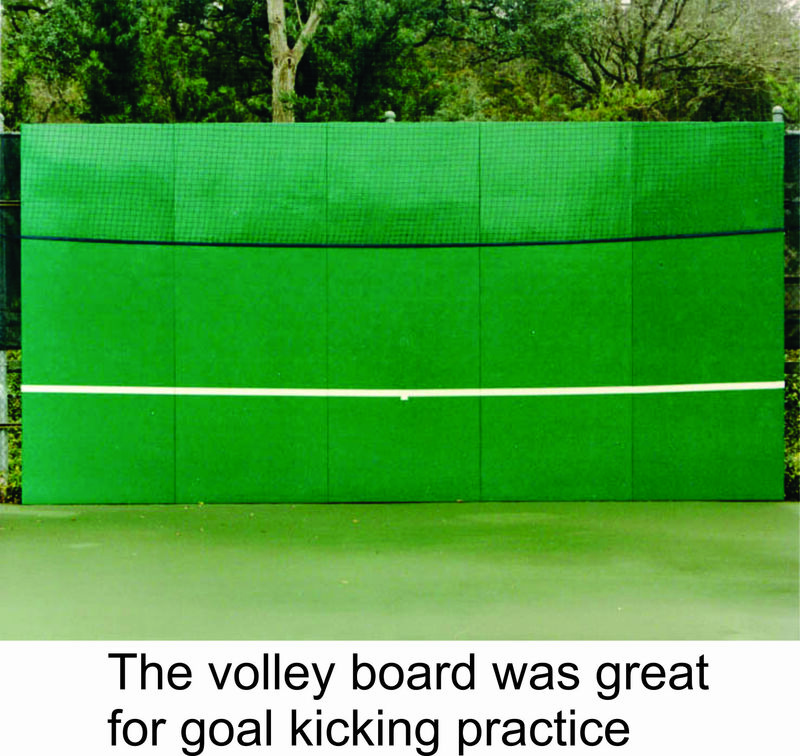 If the volley board was still around I would go and bang my head against it.